Recently I designed a course for the teaching effectiveness area of Franklin University’s International Institute for Innovative Instruction. The course is for all new instructors at Franklin, helping them to “learn the ropes” before they begin teaching their first course at Franklin. What I discovered while creating the course was that I couldn’t merely design this activity, I needed also to examine my own educational philosophy. What do I believe about teaching and learning? How does it align with my university’s educational philosophy? To begin, I needed to reflect on my beliefs about how adults learn. I’ve long subscribed to (for I have been an educator for many years!) John Dewey’s writings about learning, that to learn the student must be actively engaged in the learning environment, with other learners, and with the instructor with activities that are meaningful to the learner and that enable the learner to apply new learning in relevant, real-world situations. In this short video, Stephen Brookfield tells us about the most important aspect of teaching. My philosophy is that the teacher’s (instructor’s) main purpose is to help students learn. I asked Dr. Karen Miner-Romanoff, Associate Provost for Academic Quality and Executive Director of the International Institute for Innovative Instruction at Franklin, to record a video for the assignment about the educational philosophy of Franklin and the Institute. So I reflected on my beliefs about learning and teaching, and then I rewrote my own philosophy. 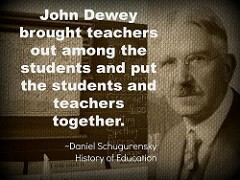 I believe that the main focus of the teacher is to enable students to learn. To achieve this, the student must be actively engaged in the learning environment, with other learners, and with the instructor. The learning experience, the assignments and activities, must be meaningful to the learner where they are currently as well as meaningful in their career or profession in the future. The assignments and activities must enable the learner to apply new learning in relevant, real-world situations. Learning must be accessible and meet student needs, and should be available in a variety of formats (online, face-to-face, and blended). In all formats, student learning must be supported. This support should include things like the library, tutoring, disability services, and student assistance to deal with challenges and problems that surround an academic situation. The main focus of the instructor is to help students learn. Learning experiences should be meaningful to the learner, applicable to the real-world (career), and of high-quality based on industry standards. Franklin University is the University of Opportunity. We are student-centered, a nonprofit, independent institution that provides high quality, relevant education enabling the broadest possible community of learners to achieve their goals and enrich the world. Students need to be supported through a variety of services. Through our wide variety of educational approaches, academic resources, and support services we strive to adapt to the needs of our students. Learning experiences need to be aligned with the needs of the workplace (professions) and society. Through partnerships with the business community and the professions, we quickly respond to changes in our society to help our students meet their goals and the needs of their current and potential employers. As I compared my own beliefs about teaching and learning with the educational philosophy of my university, I was able to reassure myself that my philosophy aligns well with Franklin’s. I recommend that all educators examine their own philosophy of education and compare it with their institution’s philosophy. We are constantly learning and growing as educators, and our philosophies change as a result of our research, continuing education, and our experiences as we teach. Not only is it a healthy exercise, but it can be extremely revealing! Consistently reevaluating our values and philosophies brings our teaching into focus, helps us to better understand our teaching strategies, and can, in fact, lead to a change in our teaching to better align it with what we believe about teaching and learning.